When I saw that video clip of Nick Sandmann smirking at Omaha Elder Nathan Phillips who was drumming and chanting, and realized just how close the two were standing, I was outraged at the boy’s insolence, shocked at the implicit insult of a white person to an Indigenous person. Later as more videos were posted, after a couple interviews with Mr. Phillips and one with young Sandman, having read through a ranged of comments from all sides of the controversy, I have come to a single defining question. Members of the Black Israelites group. The Southern Poverty Law Center categorizes followers of their theology as “hate groups.” Three of them stand together in the video posted by a member, so that would be four. A presumed fifth member stands about ten feet away listening. No one is gathered around and they are shouting their messages at passers-by. Possibly two Indigenous people, possible a couple more, including Nathan Phillips. In subsequent accounts, Mr. Phillips seems to have acted alone. 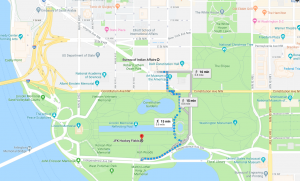 The annual March for Life gathering and walk was scheduled to begin on Constitution Avenue between 12th and 14th Streets NW and conclude at the Supreme Court Building between 1st and 2nd Streets NE. 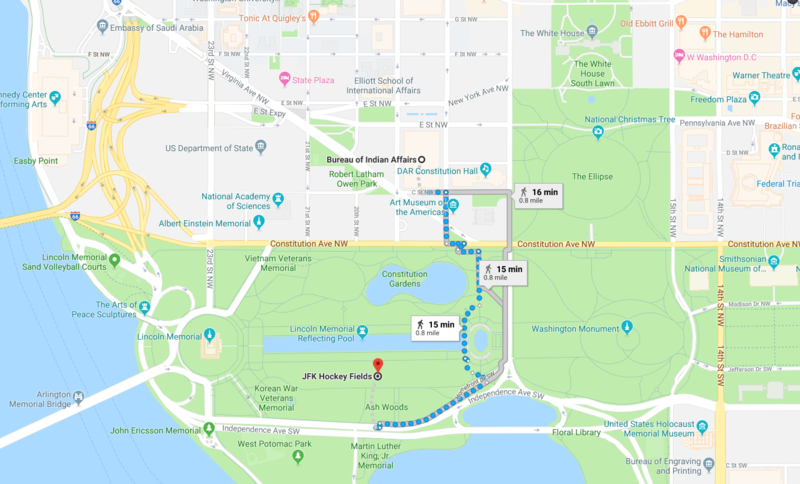 The Indigenous Peoples March was scheduled at about the same time, starting at the Bureau of Indian Affairs building and ending at the JFK Hockey Fields (about 20th Street NW if the numbered streets extended that far south) not far from the Lincoln Memorial. This area is at the opposite end of the Mall from the Capitol. The United States government was in its 27th day of partial shutdown. The Smithsonian museums and the National Gallery were all closed. Much of the Park Service staff had been furloughed. Preparations were also underway for the Women’s March on January 19. Protesters and a variety of counter-protesters to these events and the Trump administration may have been assembling for at least a few days. It is not clear how much professional media presence there was. The Covington students and the Black Israelites have both accused the other of casting the first slur. For me, they have about equal credibility, which is very little. The Covington students, apparently with the permission of one chaperone, began a “school spirit” chant which is an appropriation of the Maori Haka war ritual. On videos there is a shirtless boy leading the chant and there’s a lot of the testosterone-laden posturing one associates with football games in this country. Nathan Phillips chose to place himself physically between the Covington students and the Black Israelites. He may have been trying to defuse tensions. He may or may not have acting appropriately. It is reasonable to believe him, an Omaha Elder, when he says that his prayers and drumming were intended to calm the situation. There is no video documenting how exactly Mr. Phillips came face to face with Nick Sandmann. There is no way of knowing who moved into whose space. It is clear from the pictures that young Sandmann had plenty of space to back up. There is no evidence that Mr. Phillips’ drumming and chanting posed a physical threat to the boy or were intended to urge on anyone else in doing harm to any of the Covington students. No visible adult stepped forward to draw Nick Sandmann away from Mr. Phillips or gather the students calmly together and move them away from the Black Israelites or Mr. Phillips. Where were the Covington Catholic School chaperones as all this played out? Why did a chaperone exacerbate the situation by letting a bunch of adolescent boys engage in a chant that was both highly disrespectful to the Indigenous culture from which it was appropriated and likely to inflame hostilities on the other side? Why would a Catholic school name their athletes “The Colonels” then allow students to use this kind of dance and chant to express school spirit? 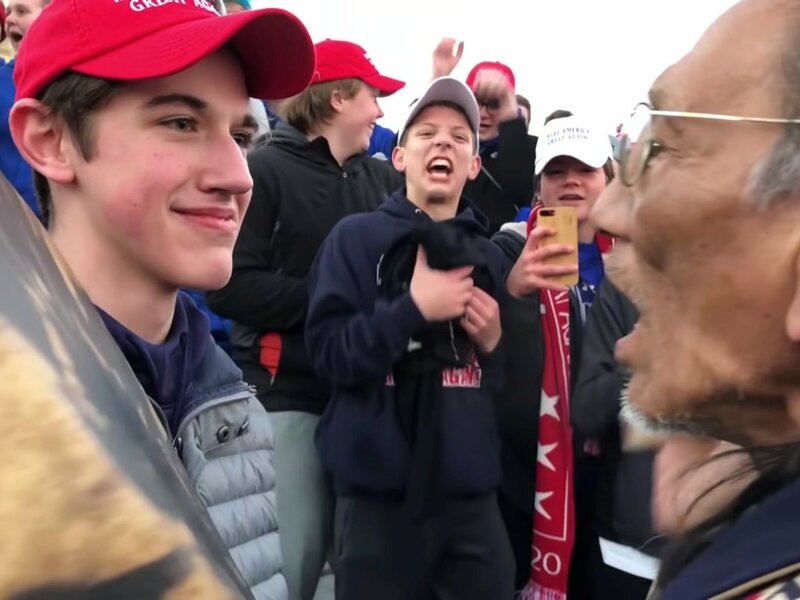 What was that expression on Nick Sandmann’s face really about as he stood mere inches from an Indigenous elder who was chanting and drumming? Would Nick Sandmann have behaved in such a way to a white man or woman and especially to a white elder? Who really believes that all of these students from Covington Catholic High School are fully enlightened young men who never use racial slurs and are blameless victims of the liberal mainstream press and a few progressives on social media? That the teachings the boys have received have shaped them to see all people as equal in humanity, men and women, white people and people of color, practitioners of all religions and believers in no religion? Who believes that at age fifteen or sixteen, the students were simultaneously boys being boys and young men acting sagely and with mature self-control? Who started it all? We don’t know and we are unlikely ever to know. What is clear, however, is that the adults best positioned to deescalate the emotional heat and fear of this encounter were missing in action and the children were running the show–and making a mess of it. At 60 you're just getting started?